The National were last in the country as the co-headliners of the inaugural Auckland City Limits Festival in March 2016. They return to play outdoors in one of New Zealand’s most iconic venues. The stunning natural amphitheatre of Villa Maria’s ancient volcanic crater, nestled amongst the vines, provides a perfect atmosphere for a summer live music experience with a very special band. The bus will leave 172 Quay Street Auckland City (opposite the Ferry Building) at 4.15pm It will then go via Ellerslie, leaving from the corner of Mitchelson St and Walpole Street (opposite the TAB staff car park – motorway side of Ellerslie Racecourse) at 4.30pm. The bus will leave promptly after the concert from the main entrance, and drop you off at the same location you boarded. This is an outdoor show that will proceed rain or shine. Be sun-smart. Bring rain protection. Bring your own chairs or blankets. Bring cash. There will be eftpos on site, but cash is always quicker. Do not bring glass. You can bring your own food and sealed bottled water or soft drinks. No branded foods (McDonalds, KFC etc) is allowed to be brought in. No alcohol. No glass. No professional cameras (SLRs or removable lens cameras). No recording devices. No tents or gazebos. No dogs or other animals, other than assistance dogs. Villa Maria Winery is an all-ages venue, and as a special offer to families, one child under 12 is welcome free per a ticketed adult. Grammy-nominated Ohio natives The National make their highly anticipated return to New Zealand for one night only at Villa Maria Winery on Sunday 25 February 2018. 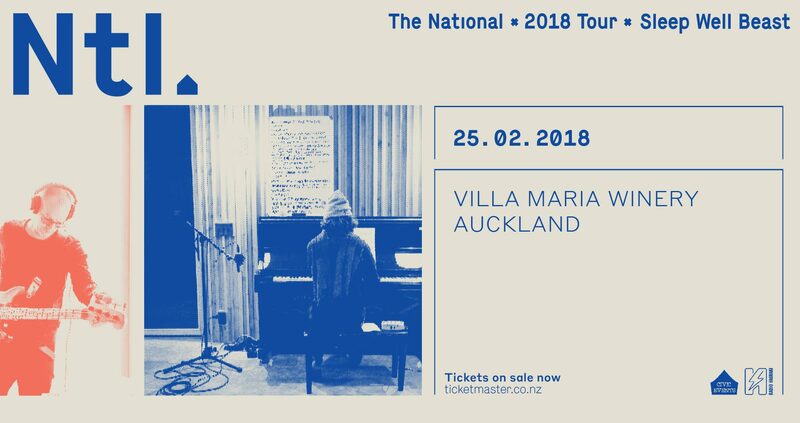 The Villa Maria show will be part of The National’s world tour in support of their seventh studio album, Sleep Well Beast, due for release on September 8. This will be The National’s fifth visit to Auckland, where they will perform for a fan base that has truly grown with the band. They first visited in 2008 for an intimate gig at The Kings Arms, followed by three sold-out shows at The Powerstation in 2011, moving up to Vector Arena in 2014, before their New Zealand outdoor debut at Western Springs for Auckland City Limits last year. With four of their six albums to date included in NME’s ‘500 Greatest Albums of All Time’, and named by Rolling Stone as one of the ‘Top 50 Greatest Live Acts’ in the world, The National will bring their new album along with their extensive and revered back catalogue to life in sweeping, cinematic and anthemic style. Tickets for this very special show by one of the world’s great live bands go on-sale from midday Friday 1 September, with a Ticketmaster pre-sale from midday Thursday 31 August. Villa Maria Winery is an all-ages venue, and as a special offer to families, one child under 12 is welcome free per a ticketed adult. Don’t miss your chance to spend a magnificent summer evening outdoors with The National, live at Villa Maria Winery. One child free with a ticketed adult – the show is a general access show and attendees are encouraged to pack a picnic, bring chairs and blankets to enjoy one of the world’s greatest live bands in the comfort of one of New Zealand’s greatest back yards – Villa Maria Winery.